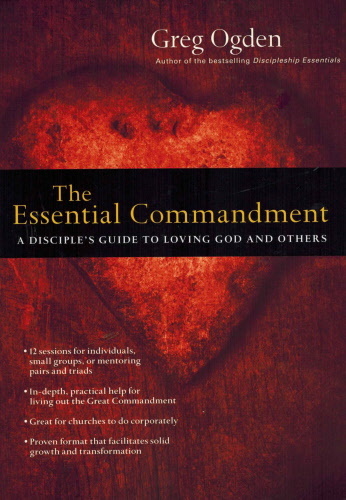 Is it really possible to live out the Great Commandment? When an expert in the law asked Jesus what the greatest commandment is, Jesus gave a clear and simple answer: "'Love the Lord your God with all your heart and with all your soul and with all your mind and with all your strength.' The second is this: 'Love your neighbor as yourself.' There is no commandment greater than these." But what does the Great Commandment look like on the ground, in our day-to-day lives? And can we even come close to living it out? Jesus, Greg Ogden believes, has a simple answer to that too. He writes, "Jesus didn't follow [the Great Commandment] up by saying, 'I know I'm asking a lot, but do the best you can. I know you'll never fully approximate this high and lofty goal, but it's still worth striving for.' . . . Jesus thinks this is possible." And with Jesus, Ogden has found, it is possible--and essential. 202 Pages.